These 12" decorative heavy-duty strap hinges will give your horse barn door an elegant classic look that will set it apart from the rest. Turn your barn into a showplace with the help of these classy barn door hinges! These 12" decorative heavy-duty strap hinges will give your horse barn door an elegant, classic look that will set it apart from the rest. 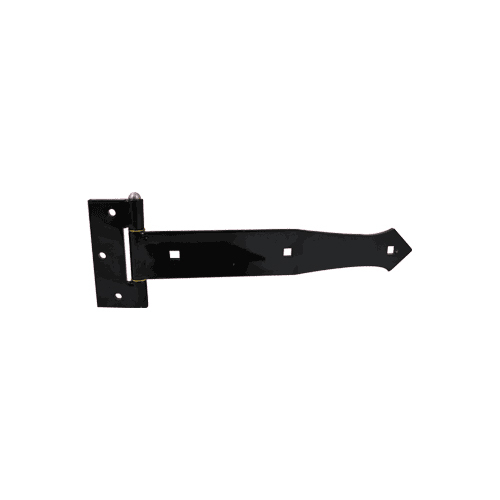 They are heavy-duty hinges that are used to support barn doors and horse gates. Hinges are sold on an individual basis, but should be used in pairs to help support the weight of the door or gate. Turn your barn into a showplace with the help of these classy barn door hinges. *Note: Fasteners are not included. The specific length it will need depends on the style and thickness of your door. Different fasteners will need to be used if attaching to steel. Hole sizes are specified, choose the appropriate steel fasteners if required. Dimensions: ¼" x 2" x 12"
Mounting Plate Dimensions: 4 ½" x 1 ¼"
Construction: Steel, pintle pin non-removable hinges. Available with disc or ball bearings, non-template. Pintle Pin & Bearings Finish: Black Zinc Plated. We have not specified a length as it will depend on the style and thickness of your door. Different fasteners will need to be used if attaching to steel. Hole sizes are specified, choose the appropriate steel fasteners if required.